My taste in art has changed so much over the years. For example: I used to hate impressionist paintings. I wanted clear lines, and strong definition. I’m sure art critics and other more knowledgeable artists and the like may fight me on whether or not all pointillism is impressionistic in nature, but to me, in my simple appreciation, and for the sake of my preferences and appetites, it is/was impressionist. In High School, I remember seeing the works of my peers on the walls outside of the art classrooms. I remember thinking that some of the pointillism works were just incredible. I remember one particular piece that my friend Kara did of a cowboy. It was so incredible, more than 10 years later it still has an impact on my appreciation of art. Over the years, I have developed a deep appreciation of pointillism (and impressionism, but that’s in different posts). I have enjoyed several pointillism pieces over the years now. I am especially drawn to the ones where each “pixel” is it’s own picture to make up a bigger image. I have developed an appreciation for the imagery and the message included in a piece of art that comes together as a big picture because of all the little pieces included therein. “The sum of all the parts…” and all that. This piece, “A Sunday Afternoon on the Island of La Grande Jatte,” I love because: it’s french, it’s on/near the water, there are sailboats in the water, mountains in the background, elegantly dressed individuals and leisure. Over the years I have created a tendency in my behavior where it takes a lot to slow me down, to make me pause or rest. I’m in a deep season of rest right now. I’ve been calling it sabbatical. A time to pause, to consider, to taste, enjoy and delight. I have been blessed recently with the opportunity to do a lot of traveling, reading, volunteering, building and cultivating friendships, developing new hobbies and devoting time to my health and fitness. Some of these components are “leisure” and this painting reflects these concepts to me. 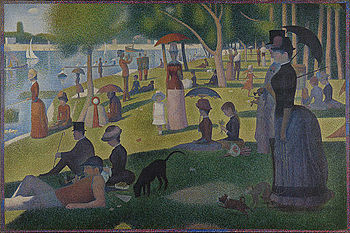 This painting by Seurat calls to me deeply in the tones of rest, delight, enjoy, be still. Being near the water is very soothing to me. Ask me my favorite place to be on any given day/time and I’ll let you know it’s at, near or on the water. There’s something about the water that grounds me, centers me and causes me to be still. This painting reminds me to rest, to be still, to have my soul restored, to pursue delight.